Happy Friday! 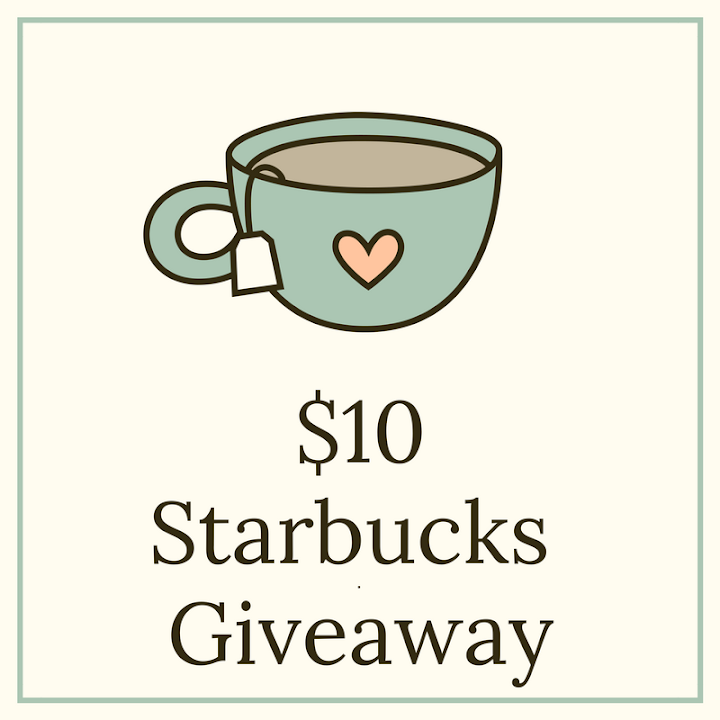 Today I'm linking up with Charlotte, Lindsay, and Chrissy for their weekly link up. Hi everyone! So many of you may have heard of Jane Davenport and her amazing new mixed media collection. I love new art supplies and when I heard about this collection, I knew that I had to try a few of the products. Two of the products that I immediately purchased was the abstract 6x9 journal and the DIY face stamp set. I really wanted to get the neutral watercolor petite palette and the brights watercolor petite palette. Unfortunately, my local Michaels does not carry the Jane Davenport line and the two other closest stores have not had the watercolor sets in stock. I kept debating whether or not to purchase the mermaid markers mainly because it's rare if I use aqua brushes and I primarily use watercolor brushes. However, I ended up purchasing them since I couldn't find the watercolor palettes...and I'm glad that I did. The Jane Davenport Mermaid Markers set comes with 12 pre-filled bright watercolors in aqua brushes. The colors are extremely vibrant and once the watercolors are gone, you can reuse the water brushes. The names of the colors are so adorable. The mermaid markers came with some simple instructions to follow before you use them. I do have some tips and notes that you may want to use if you decide to purchase your own mermaid markers. Don't squeeze the brush too hard or else a lot of ink may come out. Less is more...the colors are incredibly vibrant. The colors may fade if they are exposed to sunlight. 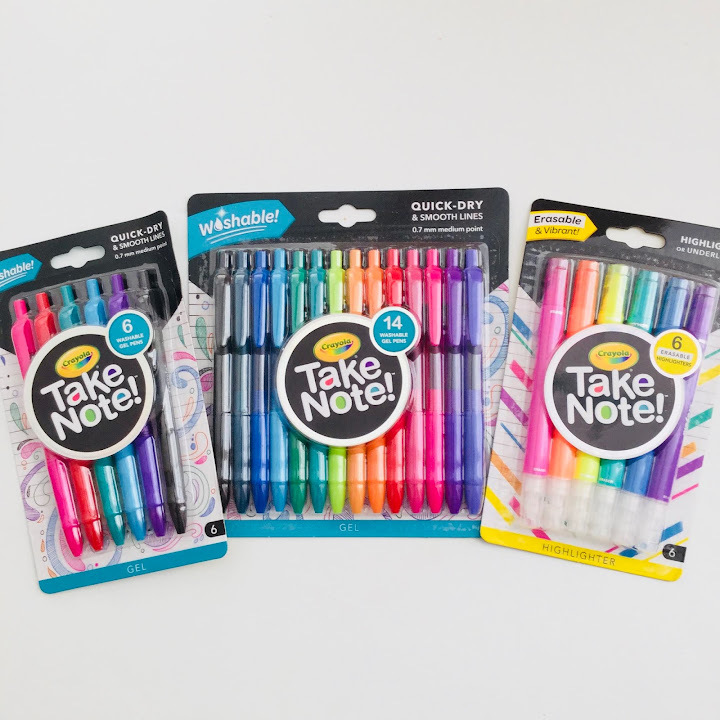 Make sure to store the markers upright in order to avoid any leakage. Make sure to check your markers before as well. Unfortunately one of my markers keeps leaking even though I store all of them upright. I also made sure that everything was screwed all the way and correctly. However, after contacting American Crafts, I was told that they would be sending me a few replacements. You may notice that some of the markers are not filled all the way to the top. Apparently the markers are supposed to be filled at least above the U in the word "PUSH" (it's on the watercolor (aqua) brush barrel). A couple of my markers were not filled above the U and American Crafts will be sending a few replacements. If you live near a Michaels, I definitely recommend that you use a coupon on this product. The markers cost $39.99, but I was able to use a 50% (maybe a 60% off) coupon. Below are some projects that I made using the Mermaid Markers. To make this painting, I put some different colors on some plastic wrapping. Then I sprayed the colors with a spray bottle and then put the plastic wrapping on the paper. I pressed down and then carefully lifted the wrapping off the paper. I let the watercolor/ink dry and really loved how it turned out. I used the same technique for this painting as well, but I added the DIY stamp set and then used my Sharpie fine point pen to draw the hair. For this painting, I put the watercolor in a palette and then used a watercolor brush to add the color onto my page. Overall, I definitely recommend the Mermaid Markers and am so glad that I decided to purchase them. Here's to hoping that there will be refills for the markers. Have you tried the new Mermaid Markers? Do you plan to purchase anything in the collection? Watching: I am so glad that Prison Break is back. I can't wait to see what happens on the next episode. Reading: I really love this book of poems. Rupi Kaur's poetry is fantastic. I definitely recommend that everyone reads her book. Listening: Kendrick Lamar's newest song is stuck in my head. I really like the beat to the song. Making: I'm still making cards for my 100 Day Project, but I also have to make some birthday cards and a card for Mother's Day. Feeling: I was able to get some extra sleep so I am feeling awake and energized. Planning: My son has a project to make for school and we decided to make 30-50 greeting cards. He will obviously do most of the work (I will probably help with stamping and cutting any papers), but he is so excited to make some cards. Loving: I really love rainy days. I love the fresh, earthy scent that is left behind after it rains. I have read a lot of interesting articles and decided to save a few links so that I could share them with all of you. I think I may start sharing some links once a month. I really love this Sketchbook series on Anne's blog. Sarah Van Der Linden was featured this month and I think her sketches, drawings, and writings are so cool. This technique looks really cool. I love that you can use it in your art journals or even use it in collages. I'll have to give it a try one day. This technique was also really cool. I never thought to make mosaics in my art journal or projects, but after watching James' video on how to make a couple of mosaics, I definitely plan to try it. I really think that everyone should read this. Kate is an artist who was diagnosed with schizophrenia and began to draw her hallucinations as a way to cope. 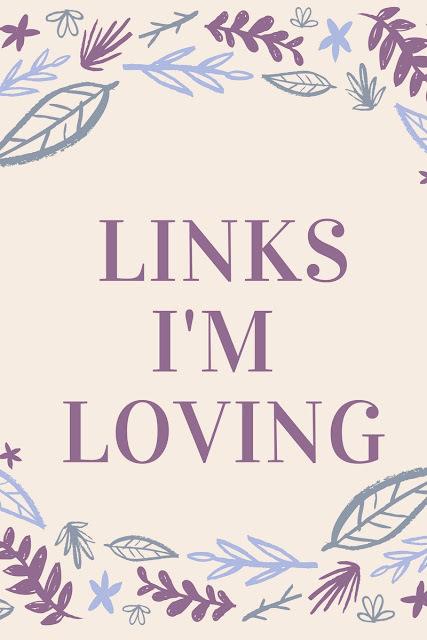 Do you have any links that you are loving? Please feel free to share. Happy Friday! 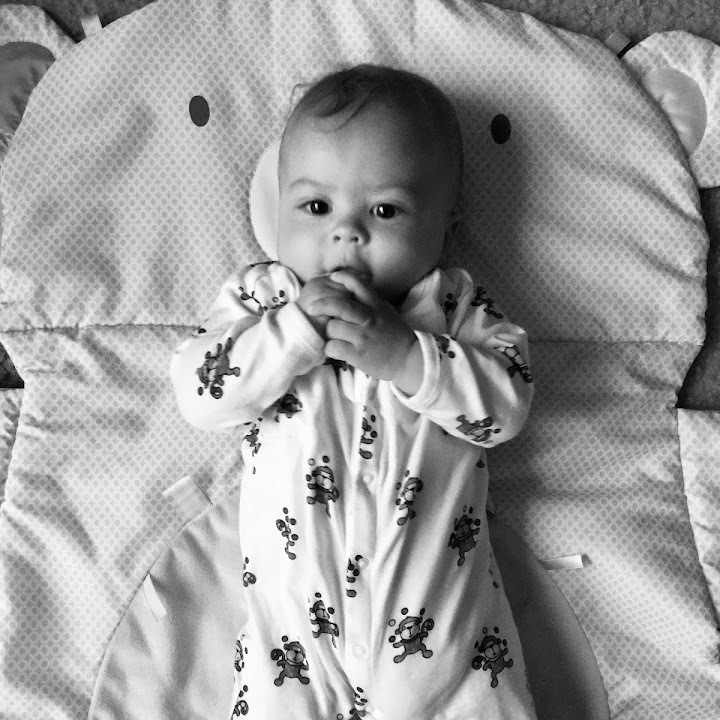 Today I'm linking up with Charlotte, Lindsay, and Christina for their weekly link up. Happy Thursday! 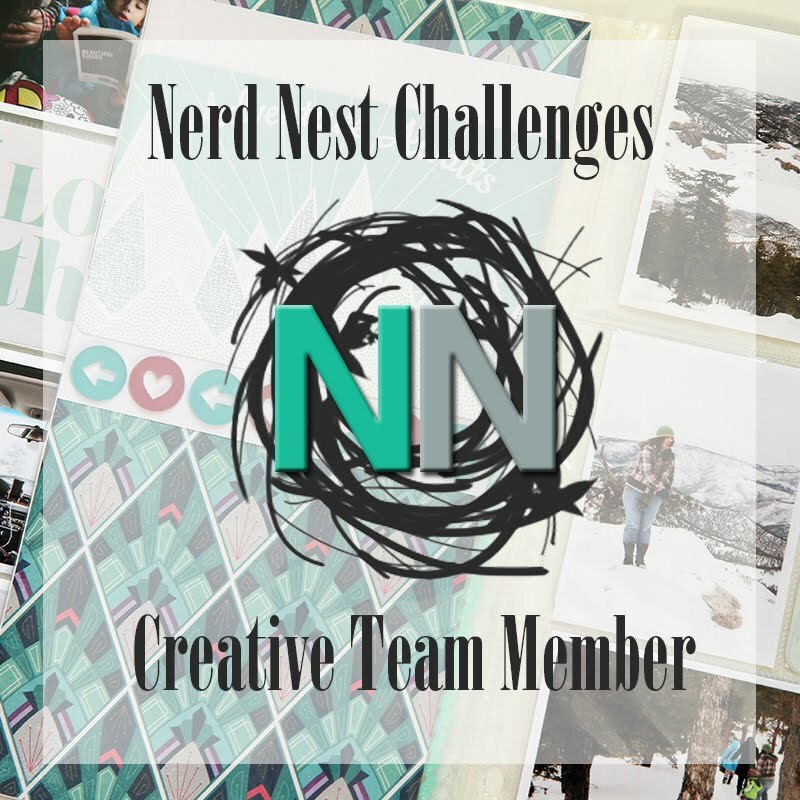 On April 4, 2017, the 100 Day Project started. The challenge will run until July 12, 2017. 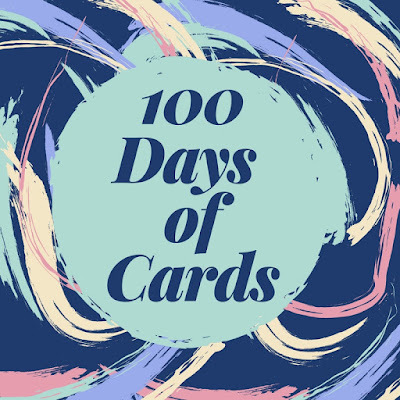 The 100 Day Project is a project/challenge where you pick something that you want to do for 100 days. Last year, I decided to join the challenge and decided to make art for 100 days. Unfortunately, I did not complete the challenge. I did make art like cards, paintings, art journal pages, etc., but I did not make art every single day. Even though I did not complete the challenge last year, I did learn a lot and came up with a list of ways to actually complete the challenge. One of the main things that I know caused me to fail to complete the challenge was not picking something specific. There are so many different things that you can make. There were days where I just couldn't decide what to make or what supplies to use. This year, I decided to pick something specific to make. I am going to make 100 handmade greeting cards for my 100 Day Project. I didn't set a time limit for creating my art. For instance, it would have been useful if I had decided to set at least 5-10 minutes everyday to create art. Everyday I will set an alarm for 5 minutes so that I can create my card. I think 5 minutes is plenty of time to make a card. However, if I go over 5 minutes then it will still be ok. I also plan to set a few alarms throughout the day so that I will be reminded that I have to make card. This will be useful because some days I am very busy in the morning and some days I am busy in the afternoon. Since my challenge last year was to create art everyday, I noticed that I had a lot of different supplies that I could use. For instance, I have watercolors, acrylics, markers, kits, Project Life cards, etc. that can be used to make art. I felt a bit overwhelmed with all of the supplies and having so many different supplies made it harder for me to choose what I wanted to make each day. You would think that having a lot of different supplies would be helpful, but it really was hard for me to choose what to make. This year I am going to use my Freckled Fawn kits to make my cards. As I have said before, I am a subscriber to Freckled Fawn and still have a ton of the previous kits. Not only am I challenging myself to make a card everyday, but I am also challenging myself to use my kits. 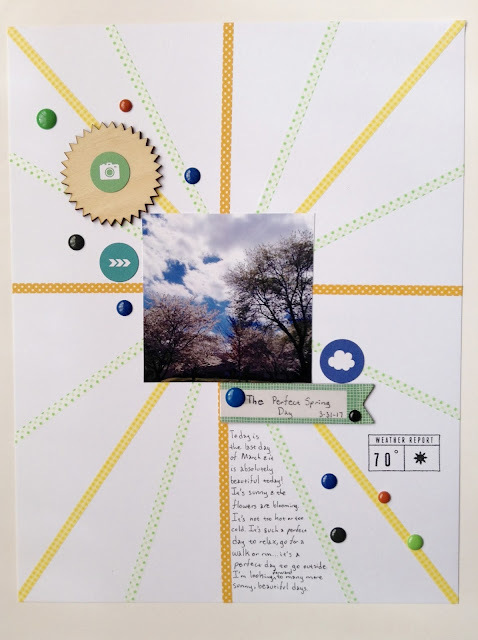 Are you participating in the 100 Day Project? If you are please feel free to share what you plan to do? Hello! 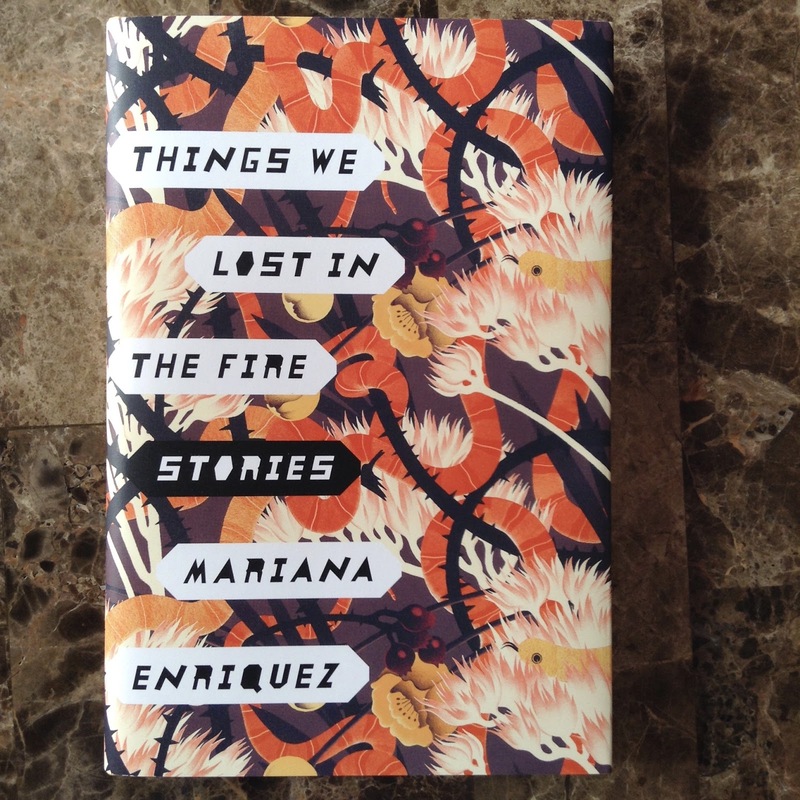 Today I am so excited to share my review of Things We Lost In The Fire by Mariana Enriquez. When I heard about this book, I knew I just had to read it. I am a big fan of short stories especially horror stories. The twelve stories in this collection are not like classic horror stories which I loved. This collection of Argentinian horror stories were amazing! Some of the stories were a bit creepy while a few were a bit strange. Just a quick heads up...there were even some that were dark and gory. I loved that Mariana Enriquez added some supernatural horror in some of the stories while a couple of the other stories seemed to be more psychological horror. I really enjoyed every single story. A few of my favorite stories are "The Dirty Kid", "Adela's House", "No Flesh over Our Bones", and "Under the Black Water". In The Dirty Kid, a woman lives in her family's old home in a dangerous neighborhood. The woman ends up believing that a child that she knows has been murdered. There are some supernatural elements and violence in this story. Adela's House is about a brother and sister who become friends with a girl named Adela. One day they decide to go explore an abandoned house. No Flesh Over Our Bones is about a woman who becomes obsessed with a skull. Under the Black Water is about a District Attorney who is investigating two police officers who allegedly murdered two teenage boys. I highly recommend this book to everyone. If you love short stories, horror stories, etc. then I think you will enjoy this book. Have you read Things We Lost In the Fire? If so, what are your thoughts? Watching: I just finished watching the current episode of Grey's Anatomy. That episode was so good. I can't wait to see the next one. Reading: Frida Kahlo is one of my favorite artists. 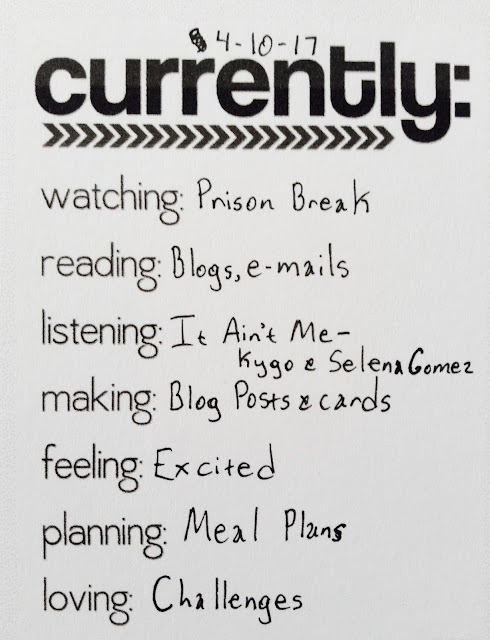 This isn't a typical diary where she documented what she did that everyday. Her diary is filled with sketches, letters, notes, and other writings. Listening: This song has been stuck in my head. 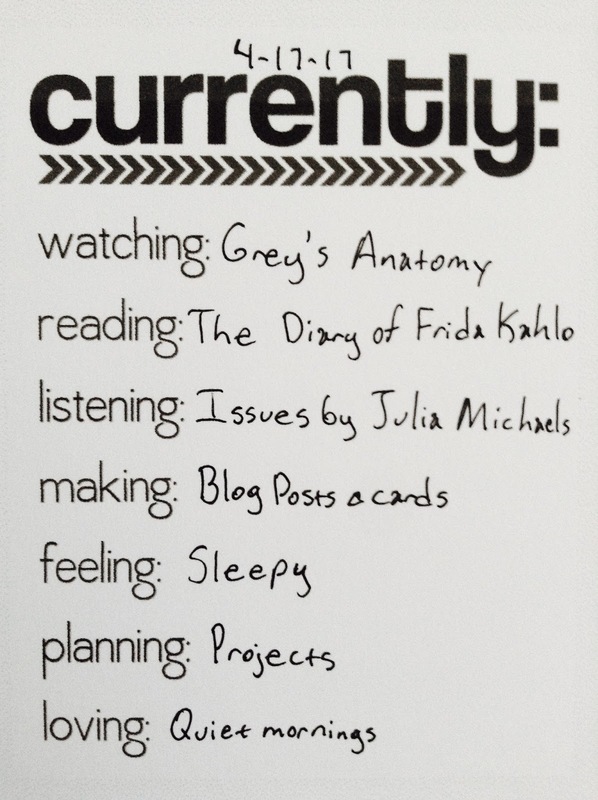 Making: I have been editing a few blog posts and made a card for my 100 Day Project. I have also been making layouts. Feeling: I didn't sleep well and kept waking up. I really need a nap. Planning: There are so many projects that I need to finish, but I also have several projects that I want to start. I'm going to make a plan and come up with a few deadlines for my current projects. Loving: Quiet mornings are the best. Everything just seems so peaceful and I was able to get a lot of stuff done early. Happy Monday! 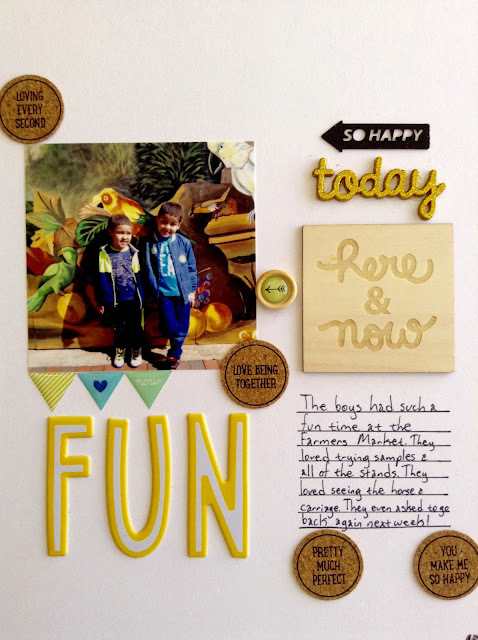 Today, I'm sharing a layout that I made a couple of weeks ago. I have been trying to use up a lot of my Freckled Fawn kits and I used several of the kits on this layout. To make this layout, I put some washi tape at the top and bottom of the my layout. Then I adhered my photo. I added the wood veneer and the "Today" glitter metal word. I adhered the metal using my Tombow Xtreme Adhesive. The "So Happy" metal word was actually a paperclip. I simply twisted and then cut the paper clip so that I was only left with the word. Next, I used my pen and ruler to add some journaling lines. Then I added my journaling. Afterwards, I added some cork circle stickers and the puffy stickers that spell out the word "FUN". Then I added some epoxy triangle stickers and the arrow button sticker. To finish my layout, I added the date using my date stamp. 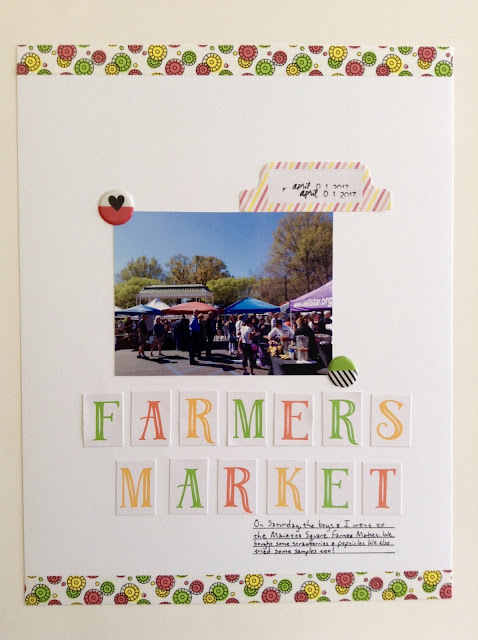 The journaling says "The boys had such a fun time at the Farmers Market. They loved trying samples & [loved] all of the stands. They loved seeing the horse & carriage. They even asked to go back again next week!" We had so much fun at the Farmers Market. We saw so many cool things like murals and paintings. In the photo, the boys are standing in front of this really cool mural. We also listened to some musicians. The boys loved trying different samples especially strawberries and this really good juice. I even got the recipe and made some. I will have to share the recipe soon. Freckled Fawn Embellishment Kit - "Citrus Twist"
Freckled Fawn Embellishment Kit - "Gypsy"
Freckled Fawn Embellishment Kit - "Silver Lining"
Happy Friday! 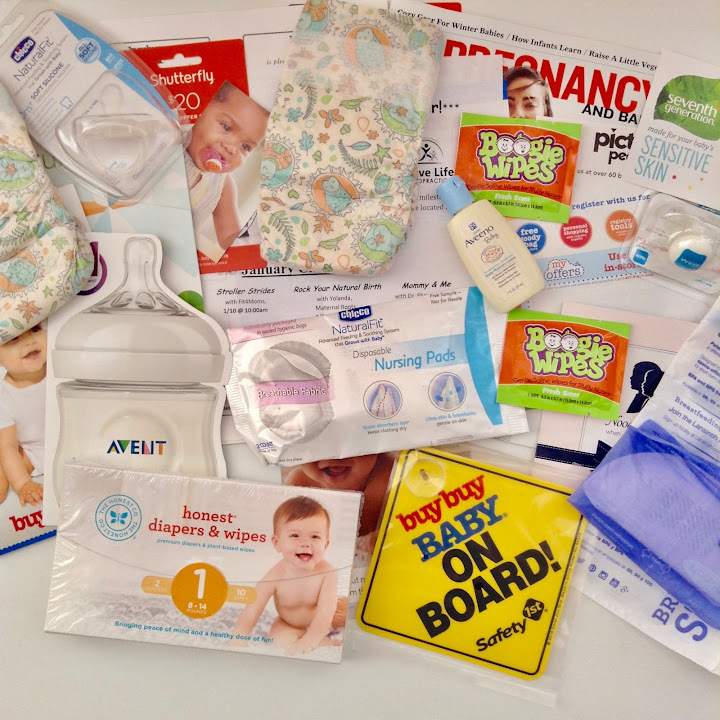 Today I'm linking up with Lindsay, Charlotte, and Christina for their weekly link up. Happy Thursday! It's been so much fun using this Freckled Fawn kit. It is perfect for Spring and Summer. I have loved using it for making layouts of my family's day at the Farmers Market. Today I'm going to share a layout of the amazing popsicles that we tried from King of Pops. To make this layout, I adhered my photo first. Then I added the square wood veneer. I added the sun flair to the center of the wood veneer. Then I added the puffy stickers. The "Be Cool" metal arrow was actually a paper clip. I just twisted and then cut the paper clip so that I was only left with the word and arrow. I used my Tombow Xtreme adhesive to adhere the wood veneer and the arrow. Then I added some of the transparency die cuts and the alpha stickers. 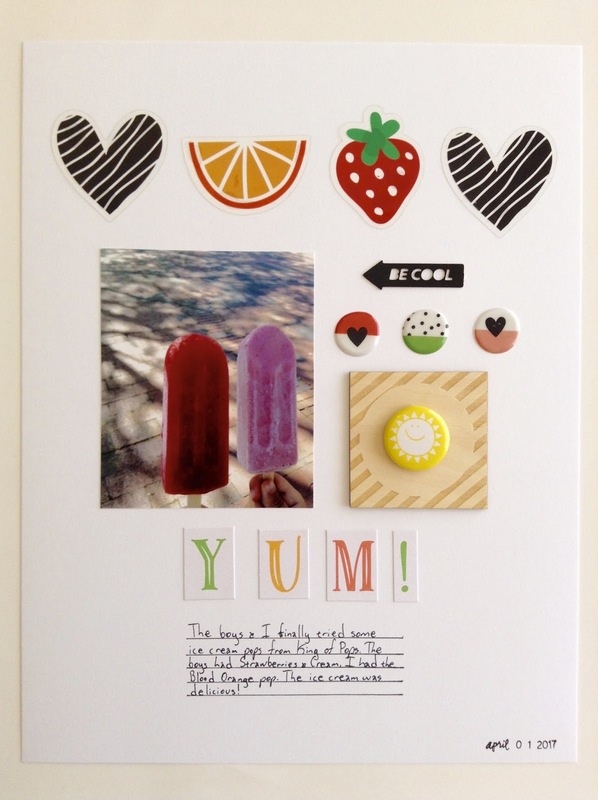 I made sure to use the orange slice and the strawberry die cuts since we bought strawberry and orange popsicles. To finish my layout, I added some journaling and added the date using my date stamp. The journaling says "The boys & I finally tried some ice cream pops from King of Pops. The boys had Strawberries & Cream. I had the Blood Orange pop. The ice cream was delicious!" Have you ever tried King of Pops? Where is your favorite place to get some ice cream or pops? Happy Wednesday! I am back again with another layout that I made of our day at the Farmers Market. For this layout, I only used a Freckled Fawn kit. I used the sequin washi tape to make a border at the top and bottom of the page. I adhered my photo to the center of the page. Then added two puffy stickers and the alpha stickers. I used my ruler to add some journaling lines and then added my journaling. To finish the page, I added a sticky note to the top right of the photo and then added the date using my date stamp. 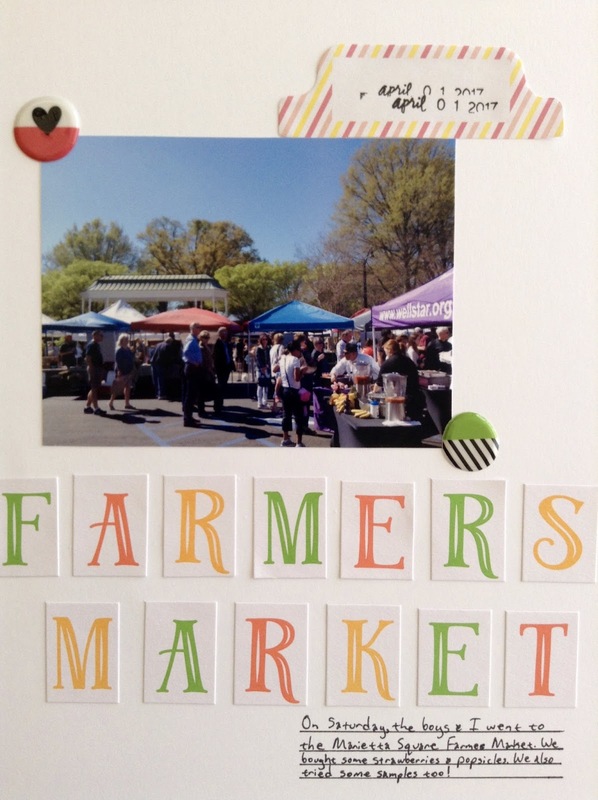 The journaling says "On Saturday, the boys & I went to the Marietta Square Farmers Market. We bought some strawberries & popsicles. We also tried some samples too!" I really like how this layout turned out. I really love the sequin washi tape and the puffy stickers. What do you look forward to when you visit a Farmers Market? Watching: I am so excited that Prison Break is back. This show was my favorite when it first premiered a few years back. Reading: As usual, I'm catching up on blogs and emails. I also just finished reading Things We Lost In The Fire by Mariana Enriquez and it was so awesome. I will have a review up in the next couple of weeks. Listening: I am loving this song. It's really catchy and I love the beat. 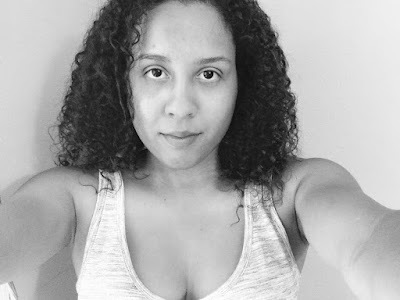 Making: I am almost done drafting and editing blog posts for this month. I will be accomplishing my goal of having 20 blog posts for this month. I am also making cards for my 100 Day Project. Feeling: I am so freaking excited because my Freckled Fawn kit along with the extra stuff that I bought with my gift card arrived today. I have so many awesome projects that I want to work on and a lot of these items are going to be used on the projects. Planning: I have to finish my meal plan for this week. Loving: I am loving the challenges and projects that I am working on. I am happy to say I still haven't had any soda since I gave it up for Lent. 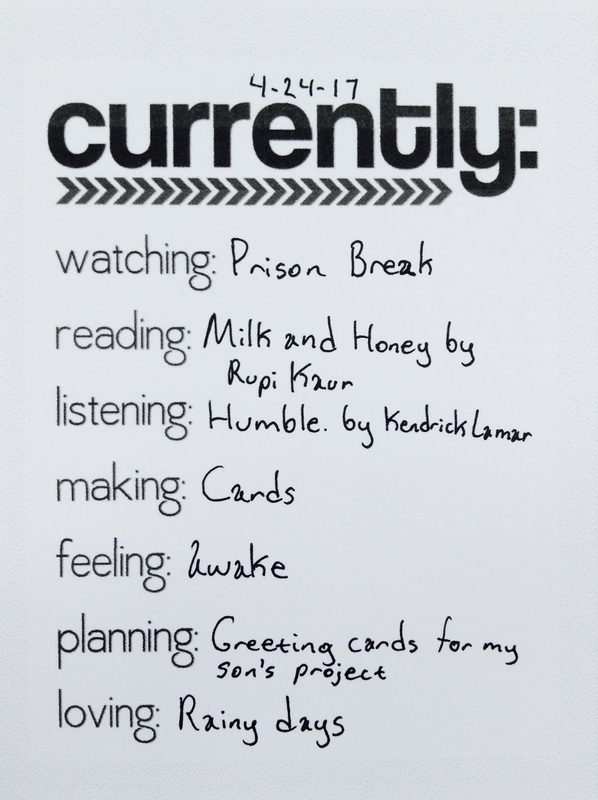 I am also doing well on my 100 Day Project and have made a card everyday. Happy Monday! 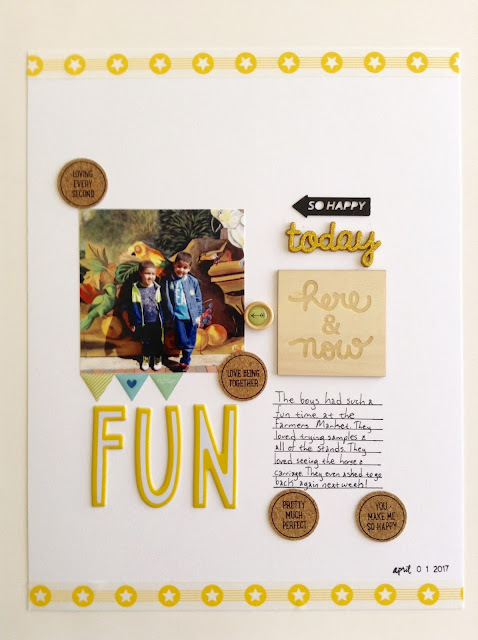 Today, I'm sharing a layout that I made over the weekend. The boys and I went to our local Farmers Market and had so much fun. I just had to document our day and the stuff that we bought. We absolutely love strawberries. It's our favorite fruit. For this layout, I chose to document the strawberries that we bought as well as the snack that I made using the strawberries. Below are some close ups of the layout. I tried to make a grid layout, but the pictures and the cut apart paper were different sizes. To try and make it even out, I used some of the cute transparency die cuts and the puffy stickers. I chose embellishments that had the same colors as the fruit as well as the colors in the cut apart paper. 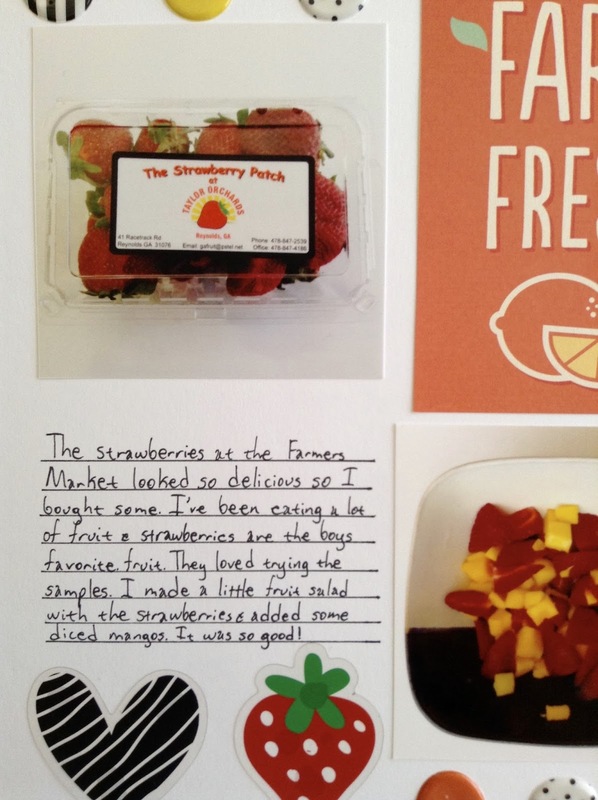 The journaling says "The strawberries at the Farmers Market looked so delicious so I bought some. I've been eating a lot of fruit & strawberries are the boys favorite fruit. They loved trying the samples. I made a little fruit salad with the strawberries & added some diced mangos. It was so good!" Do you like to shop at Farmers Markets? What is your favorite fruit? Happy Thursday! Today I'm going to share a layout that I made last week. Last week I treated the boys and myself to some Dunkin' Donuts. I had to take some pictures of them before we ate the donuts...they looked so cute! I have this adorable paper pad from Recollections. 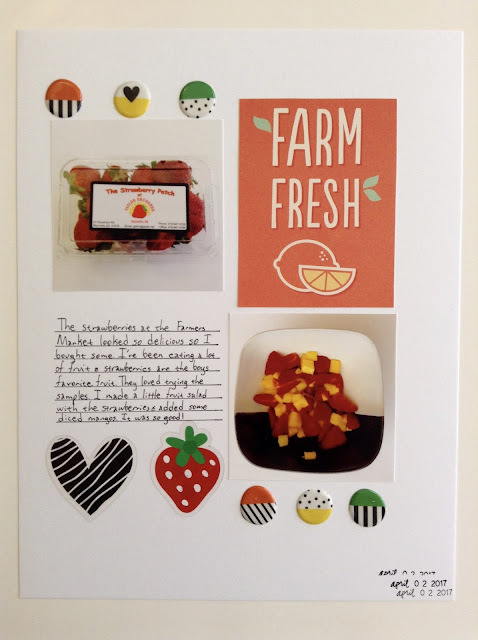 It's a food themed paper pad and has lots of cool papers like recipe cards, breakfast themed papers, cut apart papers, etc. 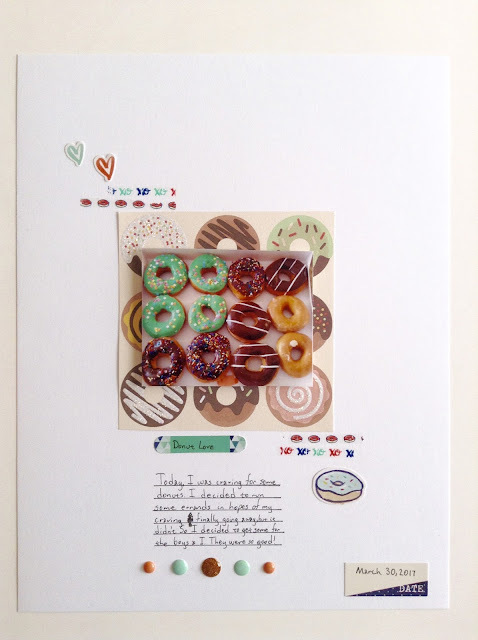 I chose to use the patterned paper with the donuts as the base/mat for my photo. Once I adhered the paper and the photo, I used the rub on pens. I did mess up a bit on the rub ons, but I think they turned out ok. Then I added the lines for journaling. I added the stickers and enamel dots. To finish the layout, I added my journaling and made sure to add the date to the bottom right sticker. Below are some close ups of my layout. I really like the stickers and love that some of the donuts on the pattern paper has glitter on them. 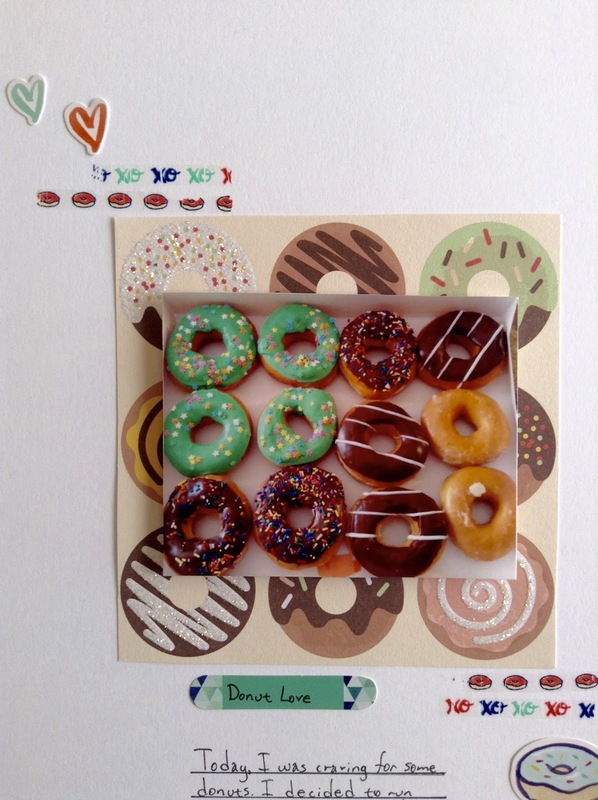 How cute are those donuts in the photo? The boys loved the chocolate donuts and the "Spring" themed donuts. 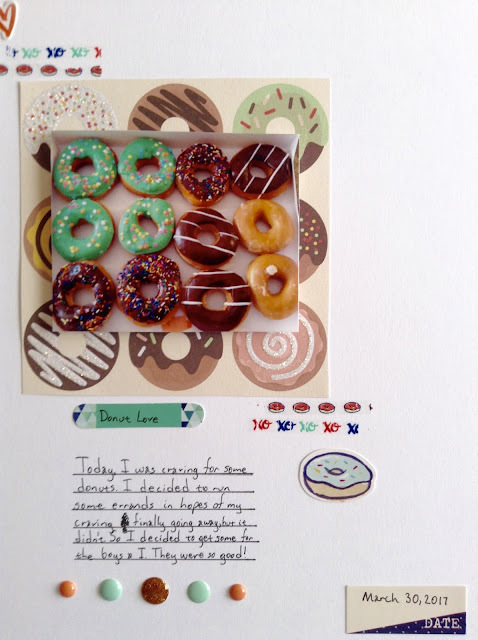 The journaling says "Today I was craving some donuts. I decided to run some errands in hopes of my craving finally going away, but it didn't. So I decided to get some for the boys & I. They were so good!" Hello everyone! Happy Wednesday! Spring is definitely here and I am loving it! Last Friday, we had the perfect Spring day and I just had to document it. Today I am going to share the layout that I made using a Freckled Fawn kit as well as a few other supplies. I am currently trying to go through a bunch of my Freckled Fawn kits. I am currently a subscriber and still have a bunch of the previous kits. I decided to use this kit from March 2016. It's perfect because it is weather themed. To make my layout, I used the washi tape and tried to make a sun. Once the washi tape was in place, I adhered my photo. Then I added the sunburst wood veneer at the top left of the photo and the green banner on the bottom right of the photo. Then I used the stamp to document the temperature for the day and added a few stickers. To finish the layout, I added some enamel dots and then added my journaling. I really love the thin washi tapes and enamel dots. I added a blue enamel dot onto the banner because I kind of messed up when I was writing on the banner. I have a bunch of pens, but it kept smearing so I added some tape on top so that the writing wouldn't smear. 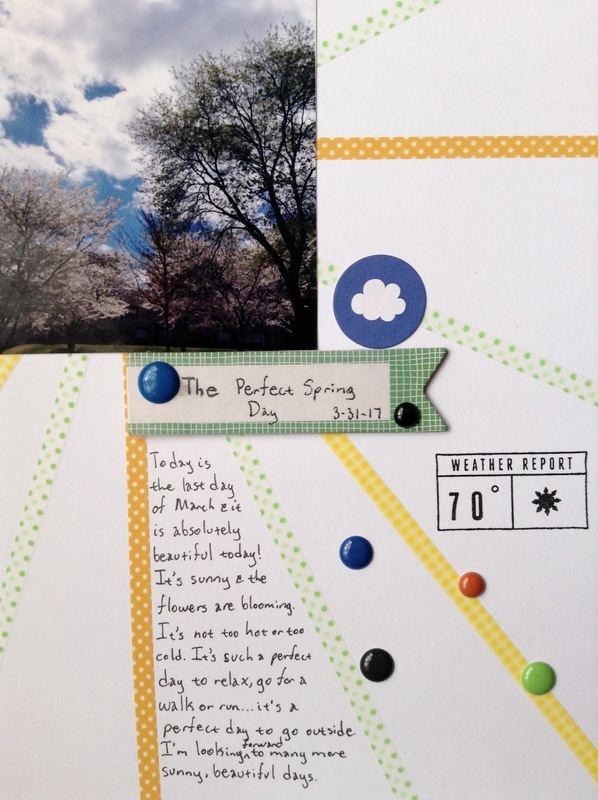 The journaling says "Today is the last day of March & it is absolutely beautiful today. It's sunny & the flowers are blooming. It's not too hot or too cold. It's such a perfect day to relax, go for a walk or run...it's the perfect day to go outside. I'm looking forward to many more sunny, beautiful days." 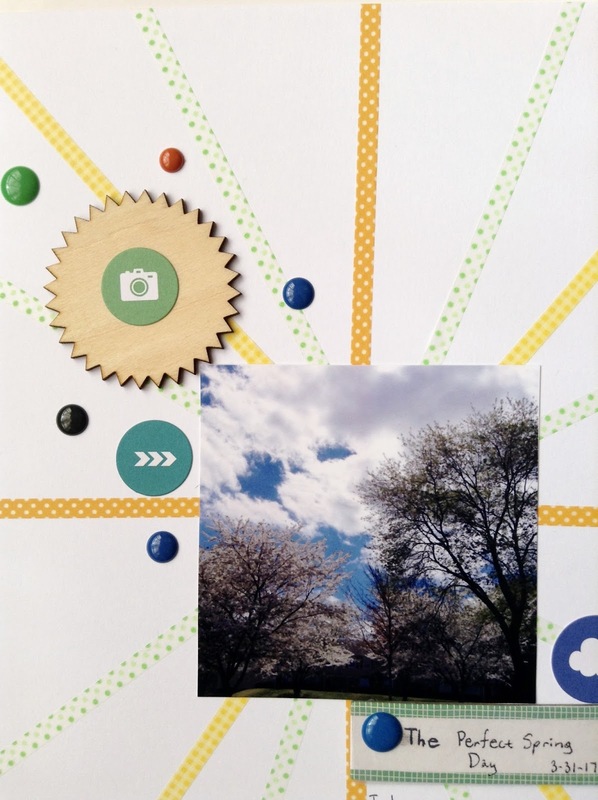 Have you been documenting Spring? Watching: It's looks really scary outside so I've been watching the news. It's raining and just looks so gloomy outside. Hopefully this bad weather goes away soon. Reading: I have been reading a lot of blog posts. I also caught up on some comments. For some reason, I haven't been getting notifications of comments on my blog so I was so surprised to see quite a few comments that I didn't even know was on my blog. So if you're a blogger, I definitely recommend that you check your comments. To those who commented on my blog a while ago and didn't get a response, I am so sorry. I had no idea that I had my comments section set up where I have to approve the comments being posted. Listening: Today is a Britney Spears kind of day. Making: I'm trying to get a lot of blog posts drafted and edited in advance for this month. Feeling: I am feeling great! Last weekend was great and I decided to just try to relax instead of trying to do too much. Planning: The 100 Day Project by Elle Luna begins tomorrow and I still haven't decided what I want to do. Loving: I got a lot of stuff done early today so I was able to get some me time and relax. I cannot believe that it's already April. Another month has passed by and that means that I have some new goals to accomplish. 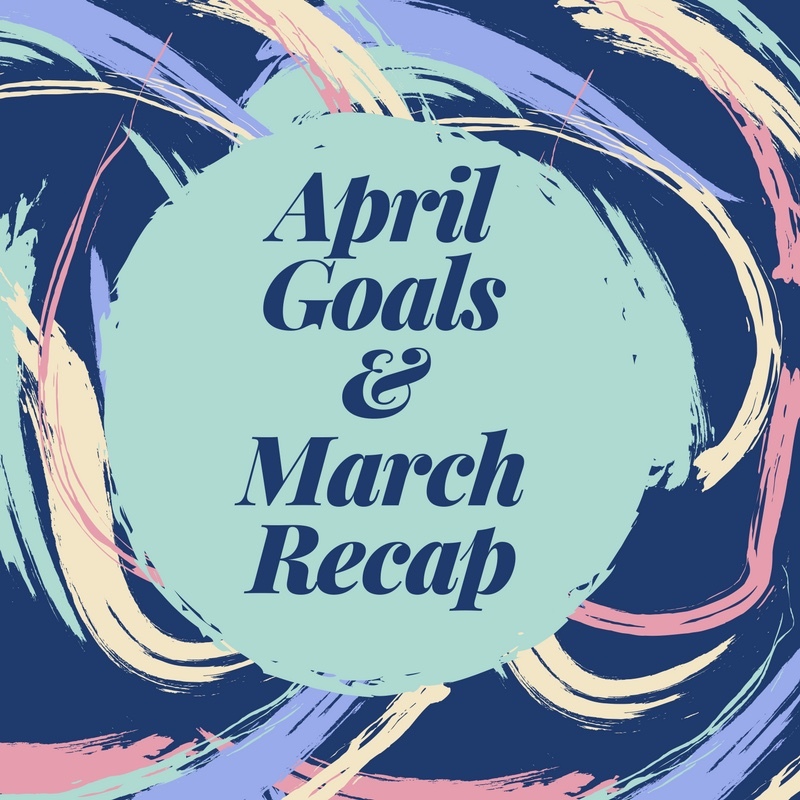 Before we get to the new goals, let's recap March. Read 1 book: This was a fail. I did read a lot of articles and blog posts, but I did not finish the book I was reading. Cook more / Eat out less: This was a pass. Post 15 blog posts: This goal was a pass. I made 19 blog posts in March. Make 5 greeting cards: This goal was also a pass. I made 12 greeting cards. Make at least 1 mini album: This was a fail. Update my Pinterest: This is a pass. I got rid of some boards and also updated a few of my older boards. I also created a couple of new boards. Declutter closets: This was a fail. Donate clothing: This was a fail because I didn't declutter my closets. No soda (giving it up for Lent): This is a pass. I am very happy to say that I did not drink any soda at all. Exercise more: This is a fail. I definitely plan on working on this goal. What are your goals for March? Happy Saturday! Today I'm linking up with Lindsay, Charlotte, and Christina for their weekly link up.